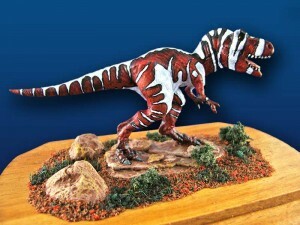 Posted on November 7th 2012 at 11:22pm	 in Dinosaurs, Miniatures. It’s been nearly two years since the last round up. I’ve just updated every one of my listing pages with new figures. What’s been happening? Not a huge amount in 28mm. Acheson Creations have put out a few more Primaeval Designs figures but seem to be making very slow progress on the backlog of greens that have been shown on Facebook. The same goes for their 15mm range. Range sculptor Richard Deasey announced a new endeavour called Project Genesis but things have been quite on that front as well. In 15mm, Khurasan Miniatures have added a few new figures. They’re currently offline due to Superstorm Sandy, here’s hoping they get back up and running soon. Splintered Light have reorganised their web site and released the raptors and sabre tooth tigers mentioned last time. 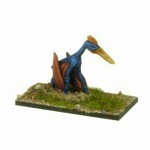 Magister Militum have expanded their 10mm range with many new dinosurs, some walking posed pterosaurs and a pack of cavemen. This is now a very extensive range. 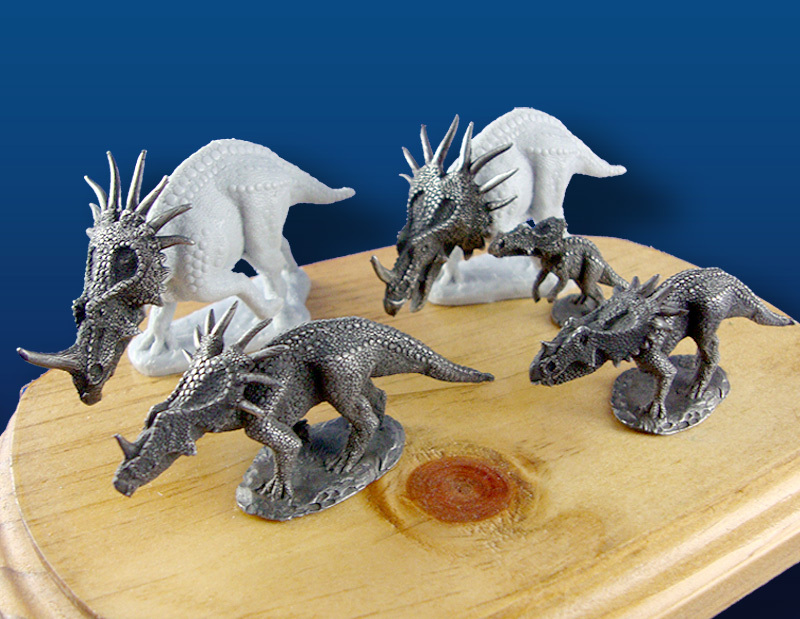 The 3D print-on-demand service Shapeways has a few dinosaur related stores: David Krentz sells products in 1/72 and 1/44 scales, whilst 3D Creatures produces a range of hadrosaurs in 1/40, 1/50 and 1/75 scales. RareBreed have a number of sculpts in a number of scales, but nothing very close to the common gaming scales. Finally, what’s better than dinosaurs? Dinosaurs in Space! 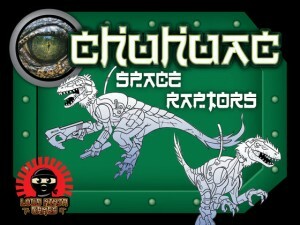 Loud Ninja Games are in the final stages of a Kickstarter campaign to fund a range of 15mm science fiction high-tech dinosaur aliens. What’s more, they will also now be available in 28mm! There’s just under 48 hours left as I type, so get in quick if you want to support this interesting range. Let’s hope it’s not another two years before the next round up. Posted on May 27th 2012 at 5:22pm	 in RPGs. Obviously some role playing games are more likely to drive you insane than others. Posted on February 17th 2012 at 10:09pm	 in Doctor Who, Games, Miniatures, My Life, RPGs. I spent a day helping my parents start clearing out their loft. 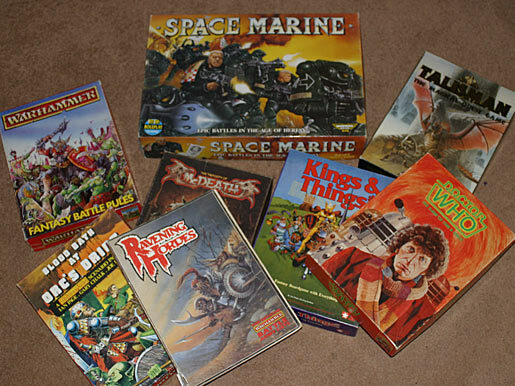 In a box marked games I found this little haul. That’s more or less every weekend and school holiday from the mid to late 1980s right there. Posted on December 20th 2010 at 1:14pm	 in Dinosaurs, Miniatures, TV. 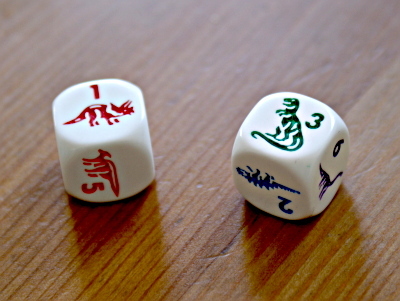 It’s been a while since my last dinosaur miniatures roundup, so what’s new and exciting? 15mm is where it’s at. Khurasan Miniatures have continued to expand their Mystri Island range including the very nice T. rex “He-Who-Kills” pictured on the right. Also in 15mm, there are a few new additions to the M.Y.Miniatures Ice Age range. 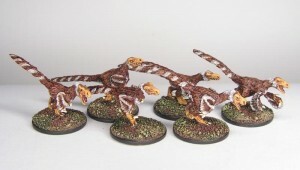 Splintered Light have blogged the greens for some raptors and sabre tooth tigers. Finally, Acheson Creations / Primaeval Designs will also be moving into this scale and have posted some photos of greens to their Facebook and Yahoo! Groups pages. Speaking of Primaeval they now have a UK distributor in the form of Magister Militum. The prices are high as you would expect for imports but at least you don’t get stung by customs and post office charges on top of that. I picked up a few figures (Plateosaurus, Protoceratops, Feathered Utahraptor, Mastodon and both Megaloceros) from their stands at SELWG and Warfare. Now I just need to review them for Ragnarok and get my painting desk set up (ha ha, fat chance, my computer is still on the floor five months after we moved). 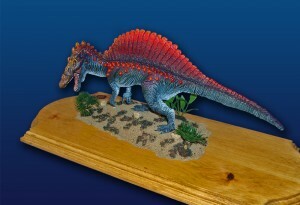 Posted on June 20th 2010 at 9:45pm	 in Dinosaurs, Miniatures. Khurasan Miniatures have previewed some feathered raptors that are intended to be 15mm Deinonychus but also work as 28mm Velociraptors. Acheson Creations continue to release figures in their 28mm Primaeval Designs range, including some dire wolves, 4 packs of Neanderthals and the Nanotyrannus shown here. Posted on April 25th 2010 at 5:20pm	 in Dinosaurs, Games. Picked these up at salute from The DiceShop. Posted on April 25th 2010 at 4:42pm	 in Games, Miniatures, My Life. Once the house move is out of the way, I need to spend a good amount of time practising photography, especially flash photography. Posted on March 25th 2010 at 8:30pm	 in Dinosaurs, Miniatures. 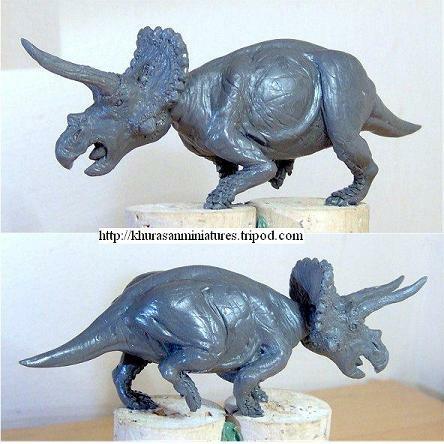 I’ve updated my 15mm Dinosaurs and other prehistoric miniatures page with Khurasan Miniatures, who currently sell a couple of woolly rhinos, but have recently shown the green for this Triceratops. Which looks like a very nice thing. Posted on March 10th 2010 at 8:35pm	 in Dinosaurs, Miniatures. Say hello to Primaeval Designs from Acheson Creations. 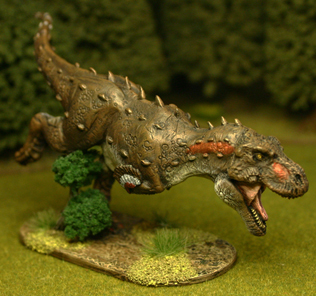 A new range of 28mm prehistoric animals (plus a very big ape). If the style of the figures looks a little familiar, then that’s because they are by Richard Deasey of DZ and Dazed fame. European distributor coming next year, so right now we in the UK will need to play the post office roulette with respect to customs fees if we make a large order. Primaeval Designs have worked closely with Two Hour Wargames to produce their new “Adventures in the Lost Lands” rules, released last week. As well as the eight items listed so far on the web site there over 30 items in production, awaiting photos, and more than one hundred masters completed! Posted on February 28th 2010 at 3:49pm	 in Dinosaurs, Miniatures. It’s been ages since I did a round up of what’s new in the world of miniature dinosaurs and friends, so let’s see what’s happened? 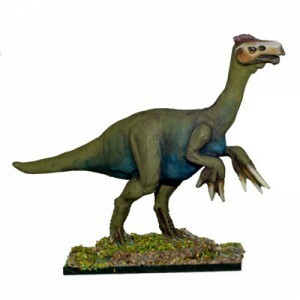 Magister Militum continue to add new creatures to their 10mm range, including the Therizinosaurus shown here. MegaMiniatures have expanded their range of 25mm prehistoric mammals with Megalonyx, Smilodon and Andrewsarc​hus. I like the Andrewsarchus, not quite so keen on the other two. Two Hour Wargames have posted some battle reports that give a flavour of their forthcoming set of rules Adventures in the Lost Lands . Top sculptor Sean Cooper or Paleocraft has recently completed a commission in a smaller scale than usual. This 1/48 scale wooly rhino has been handed over to the very lucky Jodee who is investing getting it cast and possibly putting it on sale. If you know of any other news about miniature dinosaurs then leave a comment below. And did you know that you can subscribe to an RSS feed of just my dinosaur related posts?